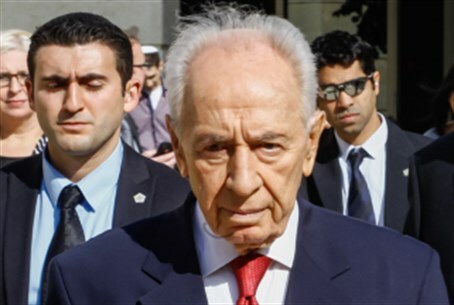 President Shimon Peres is reportedly furious over a Ministerial Committee for Legislation vote last Sunday in favor of a bill to annex the Jordan Valley, a bill Justice Minister Tzipi Livni has vowed to appeal. In particular, Yedioth Aharonoth reports, Peres is incensed over how right-wing members of the Committee were able to pass the bill. Governmental ministers who spoke with the President in closed conversations about the bill revealed his sharp criticism. "What is this good for?" fumed Peres, hinting that media coverage of the bill presents Israel to the world in a similar light as unstable regimes and banana republics. "What are we, some sort of province? They should not have let a bill like that pass," pronounced Peres. "How do we look to the world, when (US Secretary of State John) Kerry is going out of his way to bring a peace agreement?" Just last Thursday, Peres claimed the peace talks with the Palestinian Authority (PA) were "approaching the moment of truth." His comments came at the start of Kerry's January diplomatic "offensive" to force Israeli concessions, including the complete withdrawal from the Jordan Valley over 10 years. PA Chair Mahmoud Abbas has already rejected Kerry's Jordan Valley arrangement, which has been criticized by some as a "death trap" for Israel. In the closed conversations, Peres reportedly gave the impression that he felt the bill should have been overturned, if for nothing else to avoid the damage to Israel's image. While chances that the bill will become law appear slim, Peres apparently feels that the very announcement of such a bill passing in the ministerial committee harms Kerry's efforts. Meanwhile, Intelligence Minister Yuval Steinitz announced Sunday that Israel has rejected Kerry's plans for the Jordan Valley, just as Kerry's visit was drawing to an end. The announcement came as Defense Minister Moshe Ya'alon and IDF officials warned that Hamas would likely take over the Jordan Valley should Israel abandon the area, creating a second terror state following the model of Gaza. This stance comes despite reports in late December revealing that Kerry's negotiating team has been pushing IDF generals in particular to sell the Jordan Valley withdrawal to a skeptical Israeli public.